Essential hypertension (HTN) is one of the most common public health problems and a leading cause of morbidity and mortality worldwide. It is a modifiable and an independent risk factor for stroke, cardiac disease, and chronic kidney disease , HTN is responsible for 57% deaths due to stroke and 24% deaths due to coronary artery disease. Evidence suggests the growing trends in HTN prevalence worldwide. In China, the prevalence of HTN is reported to be 27%. A survey conducted in 2003 in the US, Europe, and Canada reported 28% (lowest) prevalence of HTN in the US countries and 44% (highest) in the European countries. In India, highest prevalence of HTN in urban population is men 44% and women 45% found in Mumbai (survey report reported in years 1999) and lowest 14% in Chennai (survey report reported in years 2000). Cause of HTN is believed to be the complex interaction between genetic and environmental factors. Environmental factor includes urban lifestyle characterized by sedentary job, psychological stress, junk food consisting of high-calorie, salt and less fiber food. These causes contribute to autonomic imbalance, characterized by reduced vagal tone and increased sympathetic activity. As the lifestyle is a major cause of HTN and lifestyle modification, intervention plays a major role in management and cure of HTN. Yoga is a holistic science, discovered and developed by ancient Indian sages around 5000 years back. It is a tradition of lifestyle, health, and spirituality. Yoga consists of several mind–body practices including physical postures, breathing techniques, and meditation. Several scientific investigations have demonstrated the health benefiting effects of yoga practice in healthy and diseased conditions. Yoga improves cardiovascular variables such as blood pressure (BP), heart rate (HR), HR variability, and baroreflex sensitivity (BRS)., Practice of yoga has shown to be effective in improving BP control, HR, and HR variability in hypertensive individuals. A comprehensive review by Innes et al. reported that yoga practice enhances the parasympathetic activity and reduces sympathetic tone by decreasing activation of hypothalamic-pituitary-adrenal axis. Damodaran et al. demonstrated the potential role of yoga in improving cardiac risk factors. Integrated approach of Yoga therapy (IAYT) is a residential yoga-based lifestyle intervention program for various chronic health conditions, conducted by SVYASA University, Bengaluru. IAYT consists of several mind–body practices, which include repeated sessions of yoga practice, breathing practices and cleaning techniques (designed for specific health conditions), low salt and low-calorie diet, devotional session, and turning to nature. Previous scientific investigations on IAYT have demonstrated its beneficial in chronic low back pain, anxiety, osteoarthritis, constipation, etc. None of the earlier studies on IAYT have looked into its efficacy in HTN. With this background, the present study was designed to study the impact of 1-week IAYT intervention on cardiovascular parameters in individuals with HTN. Forty hypertensive individuals (20 IAYT and 20 non-IAYT group) within the age range 30–60 years with a history of minimum 5 years of HTN were enrolled in this study. Hypertensive individuals who visited SVYAS university campus to attend 1-week IAYT program for HTN and who fulfill study criteria were included in IAYT group. Hypertensive individuals from a local area nearby SVYASA University campus who were regular antihypertensive medication were included in non-IAYT group. We included hypertensive individuals (1) within age range 30–60 years, (2) of any gender, and (3) willing to participate in the study. We excluded the individuals if they (1) had diabetes mellitus, (2) had psychiatric problem or are on any antipsychotic medication, (3) had any kind of surgery recently, (4) had cardiac arrhythmia, and (5) had previous exposure to any form of yoga in the last 1 year. Individuals were assessed in the morning between 11 and 12 PM, in a silent room, seated on a chair, in a relaxed state. Noninvasive continuous BP monitoring method was used adopting Finapres Medical Systems (FinaPress) to assess the cardiac variables. BP signals were converted from analog to digital at 100 Hz (BeatScope 1.1, TNO-body mass index [BMI]) for off-line analysis. Cardiac stroke volume (SV) was calculated with the use of BeatScope 1.1 software. Mean arterial pressure (MAP) was the integral over one heartbeat, and HR was the inverse of the pulse interval. Cardiac output (CO) was SV times HR. Total peripheral resistance (TPR) was MAP divided by CO, and pulse pressure was systolic minus diastolic pressure. SV, CO, and TPR are expressed relative to sitting in a chair. Individuals in IAYT group underwent 1-week residential IAYT intervention consisting of repeated sessions of asana, pranayama, relaxation techniques designed for HTN (the module was being used for more than 20 years); individuals followed satvika diet consisted of low salt, low calorie, and high fiber food and devotional and counseling sessions. Individuals in the control group followed normal daily routines and were on antihypertensive medication. SBP, DBP, and MAP were extrapolated from finger arterial pressure through the use of a height correction unit and waveform filtering and level correction methods, supplied by the BeatScope software package (Finapres Medical Systems B.V., 184 Netherlands). MAP, SBP, and DBP were expressed in mmHg. SV, CO, TPR, and BRS were also extrapolated from the standard formulae using BeatScope Easy version 2.0 (Smart Medical - Cotswold Business Village - Moreton in Marsh - - United Kingdom) computer based program. The obtained data were transformed to excel sheet for data analysis. Data were analyzed using SPSS version 10 (IBM Corporation 1 New Orchard Road Armonk, New York, United States). There were no significant difference found between the groups in terms of age, gender distribution, and BMI [Table 1]. There was a significant decrease in SBP (P = 0.004), DBP (P = 0.008), MAP (P = 0.03), BRS (P < 0.001), and TPVR (P = 0.007) after 1 week of IAYT intervention group compared to baseline, whereas in control group, we did not find significant difference in any of the variables [Table 2]. Between-group comparison showed a significantly better improvement SBP (P = 0.038), BRS (P = 0.034), and TPVR (P = 0.015) in IAYT group as compared to non-IAYT group [Table 2]. This study was aimed to see the efficacy of 1 week of residential IAYT intervention on cardiovascular variables in hypertensive patients. We observed a significant improvement in SBP, SBP, MAP, BRS, and TPVR in intervention as compared to non-IAYT group. IAYT is a residential yoga setup at SVYASA University campus. IAYT was designed by Dr. Nagaratna R, Medical Consultant, with experience in yoga therapy. Previous studies on IAYT showed its potential role in the management of various chronic health problems such as chronic low back pain, osteoarthritis, asthma, and anxiety. This study is the first attempt to assess the efficacy of IAYT in HTN. Yoga intervention has shown to be effective in improving various cardiovascular parameters in hypertensive and cardiac conditions. A systematic review by Hagins et al., 2013, reported that yoga is an effective intervention in reducing BP in HTN. In our study, we also found significant improvement in BP after 1 week of IAYT. Very few studies have assessed efficacy of yoga on BRS in HTN. An immediate effect study showed that slow breathing at 6 breaths/min improves BRS in healthy volunteers. In another study by Bowman et al., 1997, 6 weeks of yoga intervention improved BRS in elderly persons, whereas practice of aerobic exercises for the same duration in similar population did not improve BRS. Similarly, we also found a significant improvement in BRS, but the duration of intervention was shorter in our study than previous study and previous studies were of healthy persons. In another study by Parshad, 2011, 64 healthy students of average age 21.3 years underwent 6 weeks of yoga practice (1 session/week); postintervention, a significant decrease in SBP, DBP, MAP, CO, SV, and TPVR was observed. In our study, we also observed a significant reduction in TPVR, but we did not find improvement in CO and SV, probably because 1 week of intervention may not be sufficient to bring an improvement in left ventricular hypertrophy due to which there was no improvement in CO and SV. The intervention period was lesser in our study and the previous study was in healthy students. To the best of our knowledge, none of the earlier studies have assessed the efficacy of yoga in improving TPR in HTN [Figure 1]. The exact mechanism behind these findings is not known. 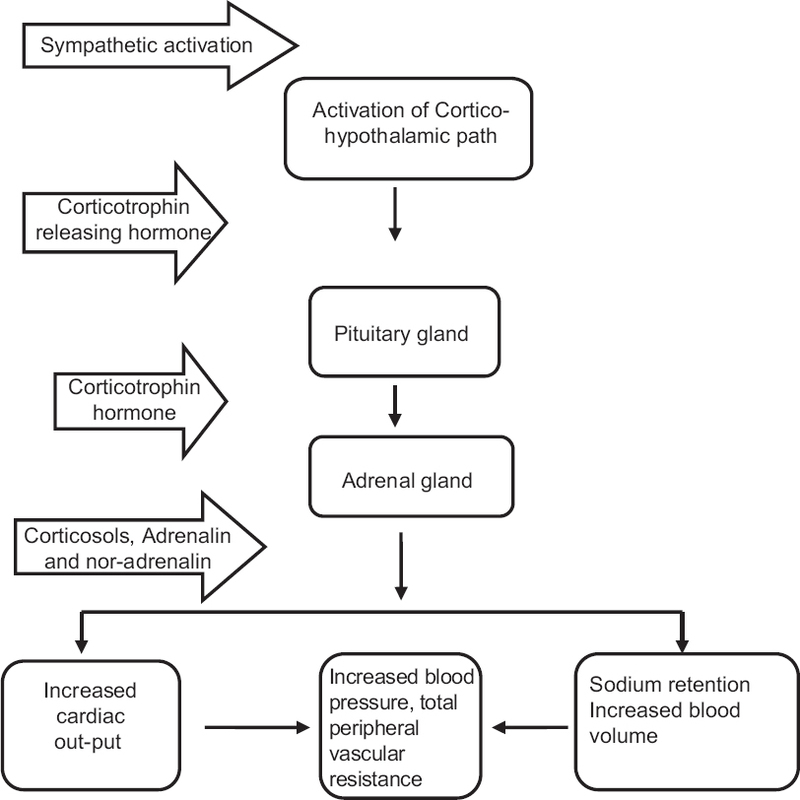 However, the possible mechanism could be; change in the lifestyle or following IAYT intervention in terms of increased physical activity, reduced routine psychological stressors, and repeated practice of relaxation and breathing practices  which are known to reduce sympathetic activity by downregulation of cortical-hypothalamic-pituitary-adrenal axis. Decreased sympathetic activity is associated with reduction in the BP and peripheral vascular resistance and enhancement of BRS., In a study practice of 20 min relaxation, every day has shown a significant reduction in BP. (1) To the best of our knowledge, it the first study to assess the effect of yoga on BRS and TPVR in patients with HTN. (2) It is the first study to assess the effect of IAYT on cardiovascular parameters in HTN. (3) No adverse effects were observed during the IAYT intervention suggesting the feasibility of IAYT in HTN. (4) As intervention was a residential setup, adherence rate was 100%. (4) IAYT is a comprehensive yoga lifestyle. The limitations of the study are (1) lack of proper control group and randomization, (2) small sample size, (3) short intervention, and (4) IAYT intervention is difficult to follow with daily routine. Future studies should be carried out using randomized controlled design, (2) other cardiac autonomic functions such as HR variability and biochemical variables should be assessed. (3) Duration of the intervention should be larger and follow-up should be done. One-week IAYT intervention showed an improvement in baroreflex sensitivity, systolic BP, and total peripheral vascular resistance in hypertensive patients. However, further randomized control trials need to be performed to confirm the present findings. World Health Organization. A global brief on hypertension: Silent killer, global public health crisis. Geneva, Switzerland: World Health Organization; 2016. Gu D, Reynolds K, Wu X, Chen J, Duan X, Muntner P, et al. Prevalence, awareness, treatment, and control of hypertension in china. Hypertension 2002;40:920-7. Jayasinghe SR. Yoga in cardiac health (a review). European Journal of Cardiovascular Prevention and Rehabilitation 2004;11:369-75. Bernardi L, Sleight P, Bandinelli G, Cencetti S, Fattorini L, Wdowczyc-Szulc J, et al. Effect of rosary prayer and yoga mantras on autonomic cardiovascular rhythms: Comparative study. BMJ 2001;323:1446-9. Hagins M, States R, Selfe T, Innes K. Effectiveness of yoga for hypertension: Systematic review and meta-analysis. Evid Based Complement Alternat Med 2013;2013:649836. Damodaran A, Malathi A, Patil N, Shah N, Marathe S. Therapeutic potential of yoga practices in modifying cardiovascular risk profile in middle aged men and women. J Assoc Physicians India 2002;50:633-40. Tekur P, Singphow C, Nagendra HR, Raghuram N. Effect of short-term intensive yoga program on pain, functional disability and spinal flexibility in chronic low back pain: A randomized control study. J Altern Complement Med 2008;14:637-44. Dhansoia V, Bhargav H, Metri K. Immediate effect of mind sound resonance technique on state anxiety and cognitive functions in patients suffering from generalized anxiety disorder: A self-controlled pilot study. Int J Yoga 2015;8:70-3. Ebnezar J, Nagarathna R, Yogitha B, Nagendra HR. Effect of integrated yoga therapy on pain, morning stiffness and anxiety in osteoarthritis of the knee joint: A randomized control study. Int J Yoga 2012;5:28-36. Rao J, Metri KG, Singh A, Nagaratna R. Effect of integrated approach of Yoga therapy on chronic constipation. Voice of Research 2016;5:23-26. Lemson J, Hofhuizen CM, Schraa O, Settels JJ, Scheffer GJ, van der Hoeven JG. The reliability of continuous noninvasive finger blood pressure measurement in critically ill children. Anesth Analg 2009;108:814-21.
van Lieshout JJ, Toska K, van Lieshout EJ, Eriksen M, Walløe L, Wesseling KH. Beat-to-beat noninvasive stroke volume from arterial pressure and Doppler ultrasound. Eur J Appl Physiol 2003;90:131-7. Bowman AJ, Clayton RH, Murray A, Reed JW, Subhan MM, Ford GA. Effects of aerobic exercise training and yoga on the baroreflex in healthy elderly persons. Eur J Clin Invest 1997;27:443-9. Parshad O, Richards A, Asnani M. Impact of yoga on haemodynamic function in healthy medical students. West Indian Med J 2011;60:148-52. Mezzacappa ES, Kelsey RM, Katkin ES, Sloan RP. Vagal rebound and recovery from psychological stress. Psychosom Med 2001;63:650-7. Herbert Benson MD, Klipper MZ. The Relaxation Response. New York: Harper Collins; 1992. Reid IA. Interactions between ANG II, sympathetic nervous system, and baroreceptor reflexes in regulation of blood pressure. Am J Physiol 1992;262(6 Pt 1):E763-78. Guyenet PG. The sympathetic control of blood pressure. Nat Rev Neurosci 2006;7:335-46. Bali LR. Long-term effect of relaxation on blood pressure and anxiety levels of essential hypertensive males: A controlled study. Psychosom Med 1979;41:637-46.